A steady flow of tropical storms has buffeted the U.S. and surrounding Nations in the Atlantic with the latest being Hurricane Florence. This latest hurricane has already carved an unprecedented path across the Atlantic and is expected to continue up the Southeast coast of the United States. Now, the latest weather reports show that Hurricane Florence's momentum has slowed, which isn't necessarily a good thing because it could mean the storm could stall overpopulated coastal regions. Most storms on the east coast tend to smash into the shore and quickly head inland as they weaken, but Hurricane Florence is expected to "stall near the coast and then parallel southwestward toward Georgia," according to Greg Postel, a Weather Channel meteorologist. Another meteorologist named Marshall Moss who is a specialist with AccuWeather technology said that the hurricane's path is quite unique. "It was located farther north in the Atlantic than any other storm to ever hit the Carolinas, so what we’re forecasting is unprecedented," Moss said. First Lady of the United States and the wife of President Donald Trump tweeted out resources for those in the path of the hurricane. Melania Trump's tweet read, "If you or your loved ones are in the path of #HurricaneFlorence, be sure you are listening to local officials. Stay safe & evacuate dangerous areas. Follow @FEMA for updates. Helpful information at ready.gov." AccuWeather meteorologist Marshall Moss added that most storms coming into the Carolinas tend to move north but that this one seems like it will stall over the region. Another meteorologist named Ryan Maue of Weather.us said: "the entire coastline from the Virginia border to Savannah, Georgia, should be on alert." The weather specialists seem to agree that the winds guiding hurricane Florence will die down for a while causing the storm's speed to be reduced to a crawl just as the center reaches the coast. The Weather Channel predicts the stall to occur between Thursday night and into Friday. Although the storm's speed is expected to slow to a crawl, it will still contain strong winds that could exceed speeds of 100 mph. Meteorologists and officials are warning that Hurricane Florence will be a formidable storm and are urging residents of the east coast to prepare for the worst. These areas will be hit with torrential rain that is expected to cause flooding in the Carolinas. The hurricane will also bring howling winds and pounding surf to coastal regions where some residents have already begun piling sandbags. 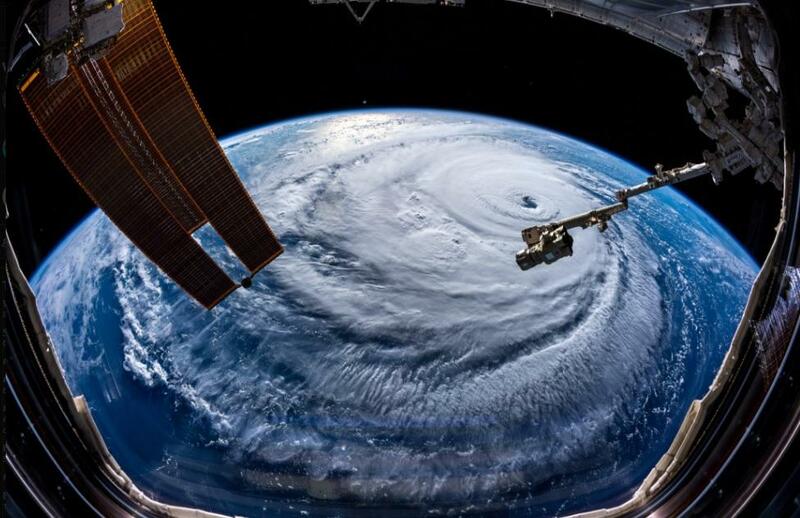 An eerie video taken from the International Space Station shows the scope of Hurricane Florence. At the same time as Hurricane Florence is preparing to batter the eastern seaboard, millions are bracing for a tropical typhoon that is headed straight for the northern Philippines this weekend. This second massive storm is expected to bring flooding, landslides, and massive waves to the nation. Emergency workers have been dispatched to northern Luzon where Typhoon Ompong, also known as Mangkhut, is expected to make its first landfall. Chairman of the Philippine Red Cross Richard Gordon said, "We're worried for the 10 million people in the Philippines living in the path of this destructive storm." The nation's weather service said Mangkhut will be the strongest typhoon this year with winds expected to reach speeds of up to 168 miles per hour. Timelapse footage from a satellite shows just how large Typhoon Ompong (Mangkhut) is as it barrels toward northern Luzon. Estimates by the Philippine Red Cross put the number of residents in the direct path of the typhoon at three million, according to communications officer Mary Joy Evalarosa. Evalarosa also said another seven million are in danger from the typhoon due to the intensity of seasonal monsoon rains. The Philippines faces an average of 20 typhoons a year causing widespread flooding. The country's most devastating storm on record is Super Typhoon Yolanda (Haiyan). The Super Typhoon left over 7,350 people missing or dead in 2013 making the deadly tropical storms a part of life for the islands. State weather services warned of heavy rains and strong winds that are expected to begin Friday. Hurricane Florence which is threatening the east coast of the United States is just the latest in a long list of Hurricanes to buffet the country. Last year, Hurricane Irma destroyed huge swaths of Florida and the Caribbean and was quickly followed by Hurricane Maria. Texas also suffered catastrophic damage last year when Hurricane Harvey caused entire cities to be engulfed in bacteria-ridden flood waters.